Isuzu is planning to launch compact and Hybrid SUVs in the Indian market. It may also start manufacturing the MU-X SUV in India if the demand increases. Along with MU-X, it has 3 pick up trucks in the lineup. Today, Isuzu MU-X facelift was launched in India. It got additional safety features along with minor visual upgrades. 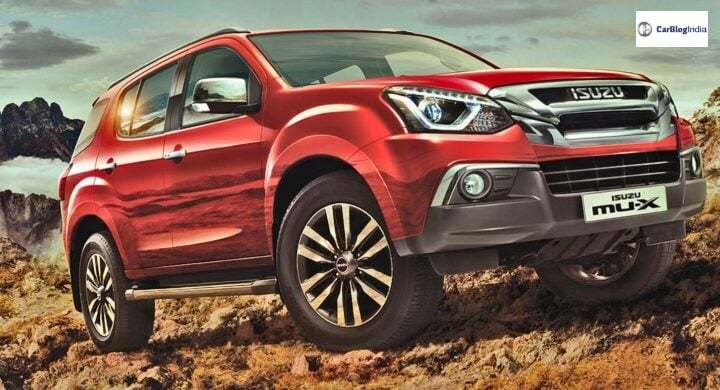 Its other model, D-Max V-Cross is also going to get a facelift next year. Both of the UVs are sturdy and off-roading ready. D-Max is one of the most known off-roaders in India, despite having a long wheelbase. Now, the Japanese Automaker says that it is developing compact SUVs. The brand has hinted of India launch too, which might happen by 2021. As we see, the demand for SUVs in India is ever growing. We have different segments of SUVs like compact SUV, 5-seater SUVs, 7-seater SUVs, premium SUVs and more. People are slowly opting out for SUVs instead of big sedans and costly hatchbacks. Also Read: 2018 Isuzu MU-X Facelift launched in India! The main reason for the growing demand for SUVs is because now SUVs offer the same practicality, comfort, and features as a sedan or hatchback. The mileage figures are also not that bad. Besides, an SUV was earlier regarded as a passenger vehicle, which has gradually become a lifestyle and necessary vehicle. The growth registered by compact SUVs is more than any other segment in the market. So, Isuzu has a compact SUV in mind and it says that the trend of SUVs would go on for some more years. Currently, both the Isuzu cars come only with a diesel powertrain. The brand hints that there might be a hybrid variant in the offing too. It already has hybrid SUVs in Japan. The brand plans to manufacture the Isuzu MU-X SUV from India. Currently, it is bought as a CKD unit at their factory in Andhra Pradesh. Based on its future demand, Isuzu will look at this process. The MU-X is priced much cheaper than the Fortuner and Endeavour. Also, it comes equipped with the latest features as well as safety features. So, the facelift could actually increase its dominance in its segment. Isuzu has sold around 5,000 units in FY 18 and now plans to increase the figures up to 7500 units for FY 2019.